The 10-year-old, owned by Caroline Mould, paraded at Cheltenham before the Shloer Chase, victory in which last year marked his comeback from illness. Henderson, who trained Sprinter Sacre throughout his 24-race career, said: "He worked on Tuesday and everything was grand. We were just a bit worried on Wednesday night - he was a bit warm in one leg. We have scanned the leg, and it gave us the news we dreaded. I think knowing at his age, and where we've been, that you can't come back for another session at 11 rising 12. I spoke to Caroline [Mould] yesterday, who is going to be here today, and I said I'm afraid we've got to say the journey's over." 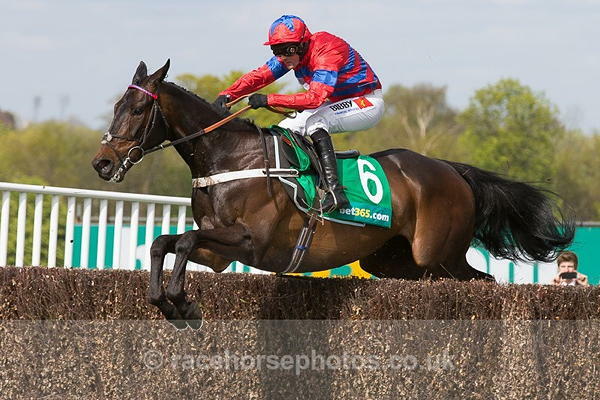 Sprinter Sacre took a bumper at Ascot on his racecourse debut in February 2010, and in all won 18 races. He was third in the Stan James Supreme Novices' Hurdle at The Festival in 2011, and went chasing the following season. The French-bred gelding was unbeaten in 10 consecutive outings over fences - including the Racing Post Arkle in 2012, where he beat Cue Card by seven lengths, the 2013 Queen Mother Champion Chase, the Tingle Creek Chase, the Victor Chandler Chase, the Melling Chase and the Champion Chase at Punchestown, all at Grade One level. But after being pulled up at Kempton in December 2013, it was discovered that Sprinter Sacre was suffering from an irregular heartbeat. He recovered from that, but was beaten twice and pulled up once in the 2015 season. However, he made a triumphant comeback at Cheltenham in the Shloer Chase in 2015, and went on to win the Desert Orchid Chase at Kempton before storming home in the Betway Queen Mother Champion Chase before an ecstatic crowd at The Festival in March this year. Henderson said: "Sprinter is going to parade before the Shloer and say farewell. If anyone wants him somewhere, to remind us of what he was like, he's going to be able to come to these sort of dos. "We're going to miss him. It's been a great journey. I've got one very very sad lad up there. Sarwah Mohammed lives with him day and night; the horse bites him all day and all night and he laughs about it. "Life goes on without him, but it's been an emotional time over five or six years, and we've loved every minute of it. "You wouldn't know which leg it is - you can't tell except on a scan. But it wouldn't hold up in the short term and you can't go for the long term, so we have had to bite the bullet. "I should think he will be going off to Shropshire at some stage [to David and Juliet Minton's Mill House Stud to spend his retirement] but we'll have to borrow him back quite a few times when he's wanted for days like this. "I think the saddest thing will be him in the paddock today - he thinks he's going to go and have a right good spin round there this afternoon. He thinks he's here for a completely different reason. He'll want to race. "He's been a great part of my life. It's been an extraordinary journey. If we'd finished it after Kempton [when he was pulled up in the Desert Orchid Chase in December 2013] then he would have just been the most fantastically good racehorse and you would have been able to leave it alone. But what happened last year is something that will never be repeated, in terms of emotions anyway - it took us all to the brink. "Ability and charisma went together with him - very often they don't. You go to the sales and buy a beautiful horse and nine times out of 10 they are rubbish - just very pretty. He was the epitome of the horse who looks the part, moves the part, and it has worked. "I think he looks as well as he ever has. He is in staggeringly good form - there's the sadness. We all said, if he didn't want to do it, he'd be telling us in his work. He's giving us all the right signs and is in fantastic form. It's three weeks until the Tingle Creek and he would have worked yesterday. "We've been very lucky over the years, and I'm going on so there is room for more. For a long time I protected See You Then as my best horse, but those two years when Sprinter Sacre was unbeatable... He never disappointed, not until it went wrong - he was peerless. "There was probably no bigger day than today last year. It wasn't his final hour - he improved all year afterwards, and to me he was nearly a better horse at Sandown than he was at Cheltenham. This day, when it really had to happen, was the most crucial day. We knew that if it didn't work that day, that would have been it - there'd be no more. It was a vital day. The amazing thing was the crowd that November afternoon was a March crowd. I think the horse knew it, and I have to thank everyone on his behalf. He adores the whole thing, and no one is going to enjoy this afternoon more than Sprinter Sacre himself. He's alive and kicking - we're not at his funeral, we're at a celebration of his life. "Last March when he won was probably the biggest day of my career. You couldn't fail to be moved by it, and it was very special. The support he has makes us know it is worthwhile. It's like playing a home game - the crowd's behind you. One of the greatest days was when we took him to Ireland, which we always promised we'd do. Their welcome to him, and that whole day at Punchestown, was one of the very special ones."